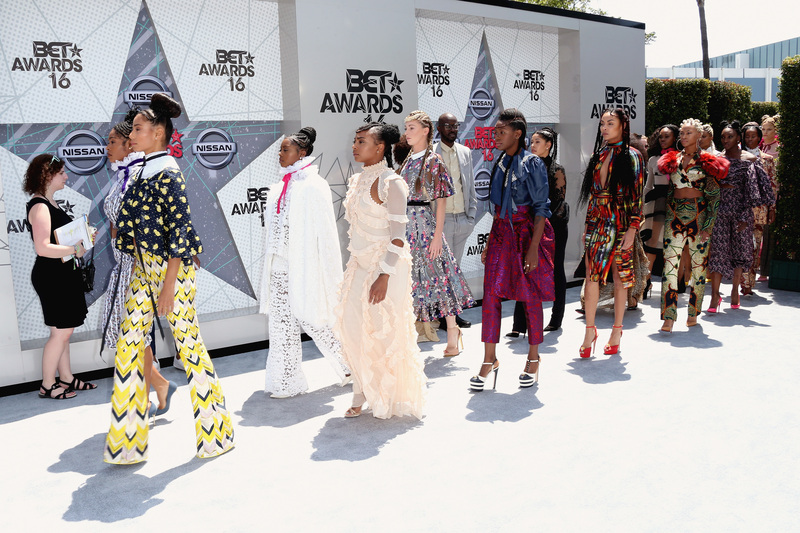 In a surprise move that has all of social media buzzing, Queen Bey's "Formation" dancers at the 2016 BET Awards stormed the red carpet in a stunning display of glamorous, no-holds-barred style. From white fur coats to floral suits, gauzy pink gowns to dramatic, cropped separates, these women clearly came to slay tonight. Is anyone really surprised? Beyoncé is nominated at the June 26 awards show for several prizes, including Best Female R&B/Pop Artist and Video Of The Year, but it looks like she's got a plan to get the Beyhive buzzing early. From the response to these looks on social media, it would seem that few are taken aback by this kind of entrance. Despite all the secrecy and surprise that surrounded both Lemonade and the "Formation" tour, it's no shock to see Bey's leading ladies slaying the sartorial game. I've never seen a better definition of #squadgoals, but then, what else can you expect from Beyoncé's team? I mean, look at all this beauty! The hair, the clothes, the shoes: It's all so unapologetically badass. It will be hard to beat this appearance tonight. Talk about showing coordination. Check out the images below to see this magic for yourself. If all this gorgeousness is any indication, the 2016 BET Awards are going to be unforgettable. Are you ready?